Radio delete panel (a result of the 15" subs not fitting in the doors, of course). What a super thread ... thanks for sharing ... this is an event that's going on the bucket list!! Brian-- Any chance you're out in Cali now? 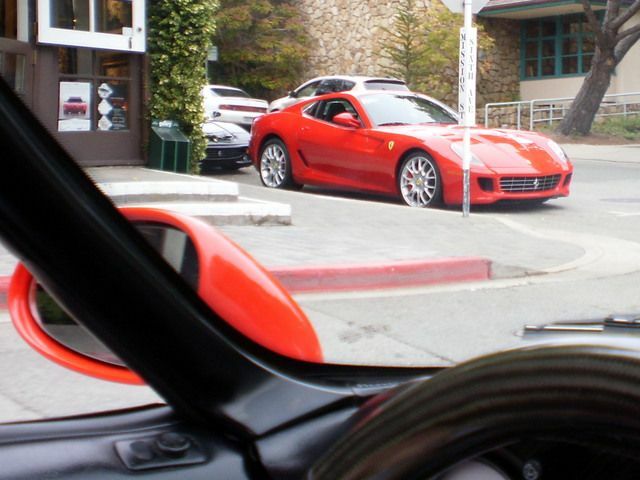 Just saw an F. Yellow CGT driving away at the Carmel Concours. Since we passed each other on the road at last month's CO PCA Parade, it would be swell to see you & your ride here, too. Sorry, neither a blond or a chica. Wish I was there but my wife and I kinda spent my "car time" budget in Colorado - kids wouldn't be too pleased if we disappeared for another week! 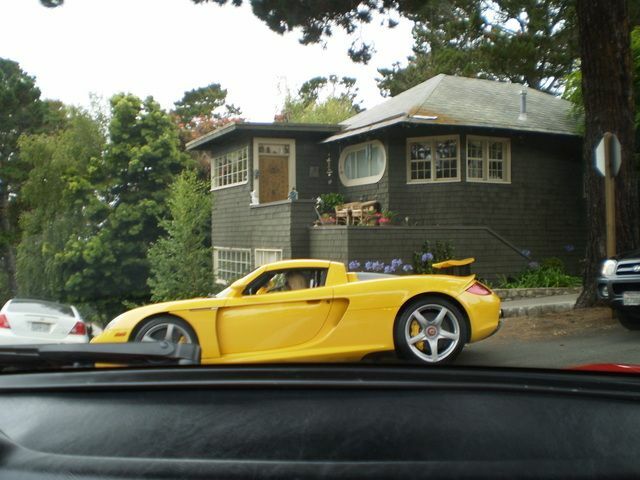 We'll meet someday, probably back in CO.
By the way, word is there's a white CGT roaming round the peninsula. White was actually my first choice when I was shopping. If you see it could you snap some pics? Have fun! p.s. - Have I ever told you I love your car? Editor's note: Fun ... 'dueling' photo thread with RJT. Me? I don't care as long as it has a Porsche Crest on it and is not another Cayenne. Jo-- On the short drive to Carmel, I passed a black Panamera going the opposite direction (AWAY from the Concours). 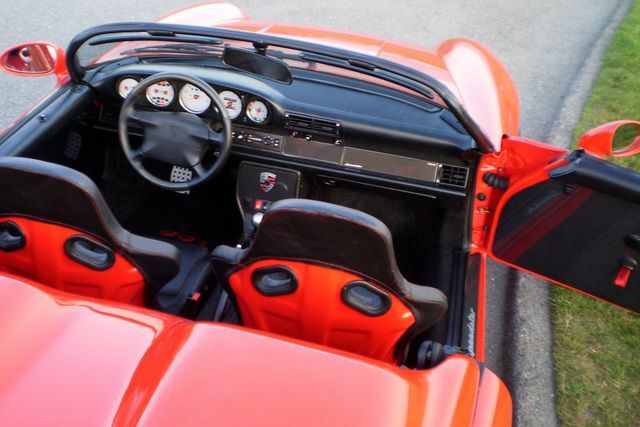 Howzabout that in your garage? Also saw Ferraris, Bentleys, but - gasp - no 993s 'til finally seeing Schmidtwerk's museum-specimen RS. This is still the only 993 I've seen in the wild, in Monterey. As I saddled her up at the show's end, a tow truck lady slowly drove past, saying she was about to tow her. Ooh, too exciting. Beach city dangers -- who knew? What??? You should be sorry for not being a blonde or a chica. Muy disappointing, hombre. 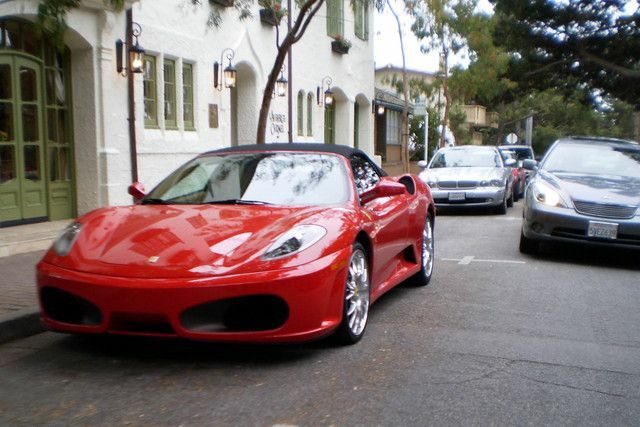 We'll meet someday, probably back in CO.
By the way, word is there's a white CGT roaming round the peninsula. White was actually my first choice when I was shopping. If you see it could you snap some pics? I'm on the case. Any excuse for Porsche pix is a'ite wit me. Have I ever told you I love your car? Yes, yes, but never too much. 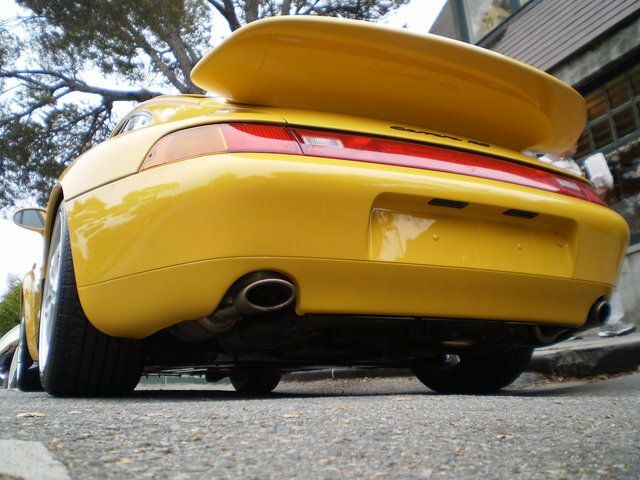 She misses you ... she knows I think highly of your CGT, 993T, & the stable-mates we saw y'all running with in Keystone. Editor's note: Fun ... 'dueling' photo thread with RJT. Jo-- On the short drive to Carmel, I passed a black Panamera going the opposite direction (AWAY from the Concours). Howzabout that in your garage? We also saw a black Panamera on the way into town on Hwy 1. Personally we both think it looked like a Cayenne that's been stepped on by the jolly green giant. Sorta squished. As I saddled her up at the show's end, a tow truck lady slowly drove past, saying she was about to tow her. RoJoT-- Very well-written sentiments about the Panamera. +1. I was at the US debut, & one of the 1st at the PCA Parade banquet last month to see it up close, get my hands on it, sit in it. But. I rarely see a Porsche from a distance that I mistake for a 993. 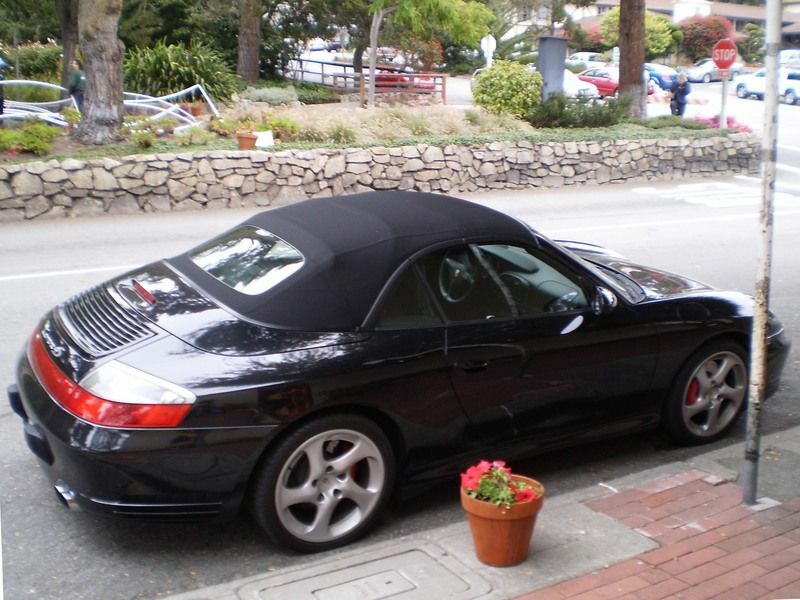 Ironically, this 996 C4S initially fooled me, because of the continuing red rear horizontal valence... shame on you! Repeat after me: "I'm a poseur that wants to look like a 993." Kinda kidding. It's a wee bit of a glimmer of hope, when you see some 993 design cues ehoed in the factory's more modern offerings. A glimmer of hope amongst many coachwork foibles. 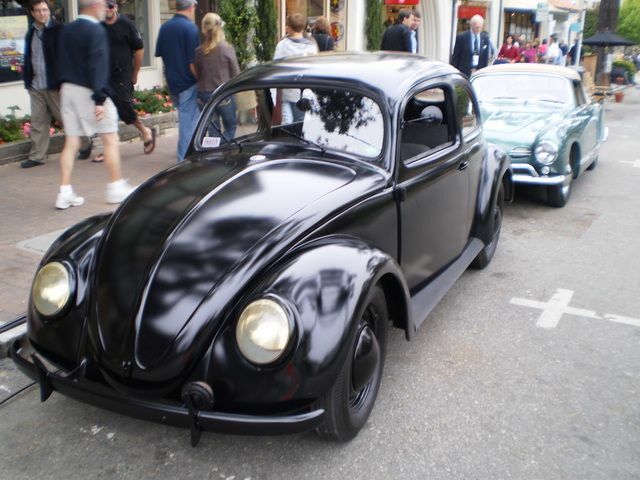 As relayed to JoAnne, IIRC, this one of the absolute first Volkswagens ever made! Last edited by curve lover; 08-12-2009 at 11:12 PM. Jager - Are you using a car mounted cam? I'm with hoggel. If you pass through Salt Lake call me too, and I'll buy both of you lunch! 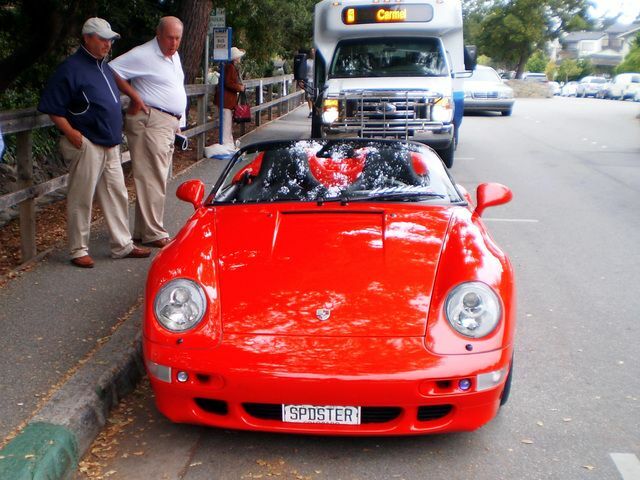 So that Carrera GT is Cheryl Dunkel's? Have not seen her in years! RSA is ready to go, bike rack installed and all.......... Probably just park it and pedal around town the way things get so congested. I'll see what I can contribute, probably all race cars come Friday. Yup Cheryl in the flesh They are camping at the track in the biggest, baddest Motorhome up on the hill. You will not be able to miss her, or her her laughing. I swear she is the happiest female I have ever met. She said Peter was racing the 550. I didn't ask if she were racing her Carrera GT this year or not. They were not showing a car in the Concours yesterday and we just ran into her by the Porsche Glockler. Where else? To those local, please post here or PM me if you're interested in meeting RLers Sat PM @ Tarpy's Roadhouse Sat PM. Should be perfect to check out the p-cars in the p-king lot, meet folks, grab grub & brews. I have a reservation for ten folks for dinner @ 7:15 PM. Under my name, Jäger. Patio open if you get there early.Tarpy's Roadhouse; 831-647-1444; 2999 Monterey Salinas Hwy; Monterey, CA 93940 5 minutes from track to cold brews. Who's interested? Any more spaces at your table? Will it be on the patio? PM sent.